Quality is never an accident it is always the result of high attention, sincere effort, intelligent direction and skillful execution, it represents the wise choice of many alternatives. 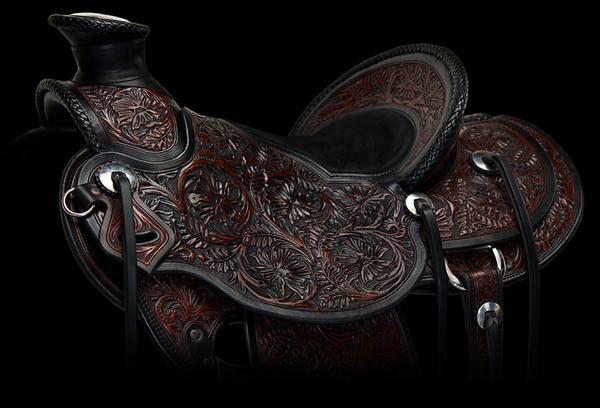 Each of my custom made western saddles is hand crafted with pride to meet your individual needs and specifications. Throughout every stage of their construction consideration is given to both the safety and comfort of horse and rider. The extreme demands of New Zealands climate and terrain has proven to be a very apt testing ground, where only the best equipment will sustain horse and rider while enduring the extreme demands of the climate and terrain. When considering a saddle it is wise to start at the tree. This is the foundation of your saddle and only correct fit and construction will ensure you and your horse's unimpeded performance. For this reason I use wood/rawhide trees made by craftsman tree maker Warren Wright . From here only the best leathers and materials available are employed with stainless steel, brass and bronze hardware being used throughout their construction. Whether you are Showing, Cutting, Roping, Reining, working or just riding for pleasure these saddles will stand up to your highest expectations and the test of time. Quality will always be remembered long after the price has been forgotten.